Succubous Liverworts ( Jungermannia species). 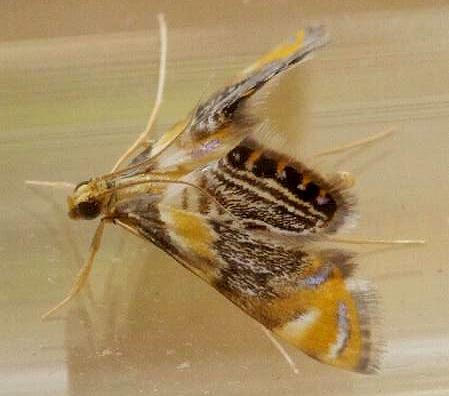 The forewings of the adult moths have a striking pattern of orange, brown, and white markings. The hindwings have a brown and white pattern, edged with a black arc containing white and yellow spots. The wingspan is about 1.5 cms. This species can be distinguished from the similar Nymphicula queenslandica by the near-straight hindwing subterminal lines, the mainly orange (rather than mainly white) near-basal stripe across the forewing, and the larger metallic patch in the middle of the forewing. Volume 3774, Part 5 (2014), pp. 401–429.